This Week in Poverty: An Anti-Poverty Contract for 2013? An Anti-Poverty Contract for 2013 might help grow the movement. This past year I’ve had the opportunity to cover the anti-poverty movement—and I do believe it’s a movement—it’s just a little too much of a well-kept secret right now. But I think in 2013, the people and groups at the forefront of anti-poverty thinking and action are poised to reach a much wider audience, and gain far greater popular support. That’s in part because the movement is led by organizations and individuals who have been fighting poverty for decades, and they offer solutions that are grounded in empirical data and the everyday experiences of millions of working Americans and families. In contrast, the opposition to anti-poverty reform relies largely on tired stereotypes, myths and prejudices—that low-income people are lazy and don’t want to work; that they only want handouts, or to live off of welfare; that anti-poverty policies have failed; and, most recently, that we can’t afford these investments. But an economy that is short on opportunity and concentrates wealth in the hands of a few is coming into focus. The interests of low-income people and a shrinking middle class are converging—everyone wants fair pay, a shot at a good education and an economy defined by opportunity and upward mobility. People are beginning to recognize that we have a proliferation of low-wage work—over 25 percent of the jobs in the nation pay less than the poverty line for a family of four, and 50 percent pay less than $34,000 a year. It’s no wonder that 28 percent of all workers last year earned wages below the poverty line, and that more than 70 percent of low-income families and half of all families in poverty were working in 2011. (Low-income defined as living on less than 200 percent of the poverty line, or less than approximately $36,000 annually for a family of three—which now constitutes 106 million people, more than one in three Americans; poverty defined as living on less than $18,000 annually for a family of three, which now describes more than 46 million Americans.) People are looking for answers. Currently, the anti-poverty movement is largely in sync as it tries to protect programs that are vital to basic human needs during the fiscal debate. But I think there are things it can do in 2013—after the budget debate—to reach a wider audience and bring more people into its fold. One possible change—or more like a tweak: many seem to focus on the lack of will in our political leadership to fight poverty; instead the primary focus might be on what the movement itself is doing to create political will. What is it doing to make itself more visible? How is it creating new relationships between low-income and higher-income people? At any given conference on poverty-related issues, are the people who know poverty first hand presenting, leading, educating and organizing? At a congressional or local hearing on food stamps, TANF, SSI or childcare—is the movement doing whatever it can to ensure that the people who have actually experienced the system are testifying? Are the more “white-collar” organizations in the movement going into low-income communities to join people and groups who areorganizing on the ground? Are these organizations showing up and also providing resources to protect homes, strengthen schools and neighborhoods and stand with low-wage workers for better jobs? How are we coming together—rich, poor, and in between—and how are we working in silos? How are we speaking—or failing to speak—with a unified voice? I also believe if the movement can coalesce around a simple, clear and concise anti-poverty agenda—an Anti-Poverty Contract for 2013—it can engage new audiences and grow significantly. Choose four or five key policies that are easily grasped and in sync with most people’s values, and forge new alliances around them. Whether or not the contract includes a group’s particular issue, hopefully groups will take a leap of faith and help push it forward, knowing that it might lead to a stronger movement and broader and deeper reforms down the road. Below is one possible Anti-Poverty Contract for 2013. I have no idea if these are the right choices—and there are some notable absences—on full employment, housing and education, to name a few. But I hope this draft serves as a conversation starter among organizations, community groups and people at the forefront of these fights—and that a core might emerge to coalesce and organize around a clear, focused anti-poverty contract this year that might serve as a compelling organizing tool. Americans generally believe that people who work hard should be able to pay for the basics, including food, housing, healthcare and education. As Peter Edelman notes in his book, So Rich, So Poor, for most of the 1960s and 70s the minimum wage paid enough to lift a family of three above the poverty line, about $18,000 today. Not so anymore. It has been raised only three times in the past thirty years and now stands at $7.25 per hour, which results in sub-poverty earnings of approximately $15,000 for a year-round, full-time employee. The minimum wage for tipped workers is even worse—a stunning $2.13 per hour, and it’s been locked there since 1991. As a result, food industry servers in the United States are three times more likely than the general workforce to be paid sub-poverty wages and twice as likely to need food stamps. If Congress had indexed the minimum wage to inflation—as they did for, say, individual campaign contribution limits or the new estate tax threshold—it would be $10.58 per hour today. Of course, any attempt to raise the wage floor is met with claims from opponents that it will result in massive job losses. This has been shown repeatedly to be complete bunk. Further, a recent report by the National Employment Law Project found that 66 percent of low-wage employees work for large companies, not small businesses, and that more than 70 percent of the biggest low-wage employers have fully recovered from the recession and are enjoying strong profits. The Fair Minimum Wage Act of 2012, introduced by Senator Tom Harkin and Representative George Miller, would raise the federal minimum wage to $9.80 by 2014, index it to inflation, and boost annual earnings to $19,600—above the poverty line for a family of three. It would also raise the tipped minimum wage to $6.85 over five years, and it would be fixed to 70 percent of the full minimum wage. The Economic Policy Institute estimates the Harkin-Miller proposal would generate more than $25 billion in new consumer spending, which would lead to the creation of more than 100,000 new full-time jobs. It would also increase wages for nearly 30 million Americans—roughly one-fifth of the workforce—because raising the wage floor improves pay for workers who earn at or just above the minimum wage. More than 40 percent of people in the private sector workforce—including 81 percent of low-wage workers—don’t receive a single paid sick day. Millions more lack paid leave to care for a sick child or family member. Nearly 25 percent of workers polled said that they have lost a job or were told they would lose a job for taking time off to deal with a personal or family illness. The United States is virtually alone among other high-income countries in not setting a minimal standard for paid sick days, and is in the minority in not providing paid leave to care for a family member. For families in or near poverty, this is especially critical, since a few days’ lost pay makes the struggle to provide the basics—like food—that much harder. Across demographic and political backgrounds, 75 percent of Americans favor a law providing a “minimum number” of paid sick days for all workers, including 69 percent who strongly favor providing workers with seven paid sick days per year. The Healthy Families Act would allow workers in businesses with fifteen or more employees to earn up to seven job-protected paid sick days each year—to recover from their own illnesses, access preventative care or provide care for a sick family member. This would be a significant leap forward in protecting all workers and their families. Americans believe that parents should be able to work without spending exorbitant amounts on childcare. Half in Ten recently reported that the average cost of full-time childcare ranges from $3,600 to $18,200 annually per child. Since there are 7.8 million families with children under age 6 that live below 200 percent of the poverty line—on less than about $36,000 annually for a family of three—that’s just unacceptable (and it’s unacceptable for the middle class too). Edelman reports that federal childcare assistance currently reaches about one in seven children who qualify for it; the National Women’s Law Center (NWLC) puts the number at one in six. Either way, it’s bleak. Last year, only 1.7 million children received a federal childcare subsidy, and Helen Blank, director of Childcare and Early Learning at NWLC, predicted that the number would fall to 1.5 million—the fewest children served since 1998. The economy can’t afford this lack of investment in working people and children. In fact, in 2010 poverty rates for families headed by a single mother dropped from 40.7 percent to 14 percent when the mother had full-time, year-round employment—and childcare is key to that equation. Research shows that low-income mothers who receive childcare subsidies are more likely to be employed, work more hours, and work standard schedules compared to mothers without subsidies. But instead of bolstering childcare assistance we are moving in the opposite direction. It’s funded primarily through the Childcare and Development Block Grant (CCDBC)—which, as a fixed federal block grant, hasn’t risen with increased demand—and it now faces serious cuts. Blank points to growing waiting lists—75,000 children in Florida, more than 20,000 in Maryland and 36,000 in Massachusetts. She said that in North Carolina, about one out of four families on the state’s waiting list had lost or needed to quit their jobs while waiting for childcare assistance. Blank said childcare needs a reauthorization with “significant new funds” so that children are in the kind of early-learning settings they need and deserve, and parents are able to work. Peer countries are able to provide affordable childcare; why can’t we? Americans intuitively recognize that there is no excuse for any child to go hungry in the wealthiest nation in the history of forever. And yet it is our most vulnerable population—children—that is particularly suffering from hunger. More than 16 million live in food insecure households, including nearly 25 percent of all children under age 6, despite the fact that the parents of hungry children typically have full-time jobs. Hunger has a tremendous impact on young children’s health, future potential, and cognitive, social and emotional development. In 2009, FRAC laid out seven steps to ending childhood hunger by 2015 that are still relevant today. 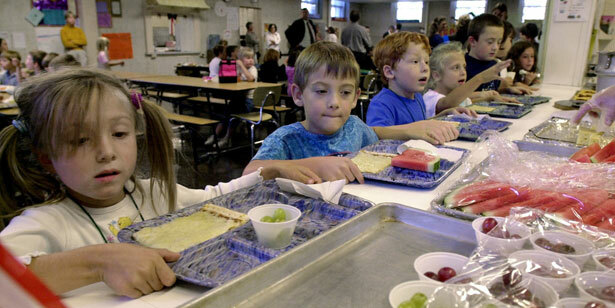 They include a range of measures such as: raising the minimum wage; creating jobs with better wages for lower-income workers; improving the SNAP benefit (which averaged $4.30 per person per day in 2010); increasing participation in the school lunch, breakfast, after-school and summer meal programs; improving WIC; engaging all federal agencies that interact with low-income children—whether it’s the DOJ which funds after-school programs, Treasury which does outreach to families regarding the Earned Income Tax Credit or others; and creating a national stream of grants and loans to make sure there are decent grocery stores in low-income communities. Americans are told TANF is a program that leads to self-sufficiency. It isn’t. The Temporary Assistance to Needy Families (TANF) program created in 1996 was touted as assistance that would help families on a path towards self-sufficiency. It’s tough to overstate what a bill of goods the American people are being sold when both parties claim it has been a success. If success means reducing the number of families with children in poverty that receive cash assistance—from 68 for every 100 families in poverty, to 27 for every 100 over the past sixteen years—then, yeah it was successful. But then why not just throw everyone off? If it means not indexing TANF assistance to inflation, so that the benefit is now less than 30 percent of the poverty level in most states (less than $6000 annually for a family of three)… then it was successful. If it means keeping TANF recipients in any kind of job in order to receive this meager TANF benefit and no actual wage—whether it’s cleaning toilets, working in a cemetery, sweeping a county garage or filing folders at an office—rather than helping people acquire the education and skills needed to secure family-supporting wages… then it was successful. If it means cutting people with significant barriers to employment off of assistance because they reached an arbitrary, state-determined time limit or failed to meet a work requirement (no matter their individual circumstances)—then indeed the program has been successful. It has directly contributed to the fact that 20.4 million people are now living in deep poverty—at less than half of the poverty line, or less than $9,000 for a family of three—up from 12.6 million people in 2000. This number includes more than 15 million women and children (nearly 10 percent of all children). If success means virtually fifty different welfare systems—for the purpose of “state flexibility”—so that Wyoming provides assistance to just 4 families for every 100 with children in poverty, Mississippi reaches 10, and California 66… then it was successful. The anti-poverty community should fight for a TANF that meets some basic standards regarding who should receive it; supports people in work or education programs that lead to family-supporting rather than dead-end jobs (including through a vehicle like the TANF Emergency Fund that placed 260,000 unemployed low-income parents and young adults in subsidized jobs during the recession and enjoyed bipartisan support from governors); and that addresses the needs of families living in deep poverty—which are usually headed by people with the most significant barriers to employment, including mental and physical health challenges, lack of a high school diploma, caring for a child with special needs, or living with domestic violence—rather than simply throwing families off of assistance. One possible piece of legislation to rally around is Wisconsin Congresswoman Gwen Moore’s RISE Act. Among the changes it calls for are adjusting each state’s block grant for inflation so it’s no longer frozen at 1996 funding levels, allowing education to count towards work requirements, providing childcare for all work-eligible parents and prohibiting time limits of less than sixty months. Even if the anti-poverty community were to win on subsidized jobs alone, that would be a significant victory. An Anti-Poverty Contract for 2013 wouldn’t guarantee a win on one or any of these five issues this year. But it could engage people who currently aren’t being reached by the anti-poverty movement; demonstrate why the movement’s policies are good for the entire nation; and offer an opportunity for people to work together for these and deeper reforms moving forward. I would be interested in constructive comments below, as well as in e-mails to weekinpoverty@me.com. Thank you for posting the link regarding why hasn’t the White House visited with low- income folks. I’m a homeless mother that blogs on the Huffington Post and I’d like to meet with the President myself but I know that's a pipe dream because unless I’ve got money to give to any politician’s campaign, I’m a faceless number in the growing epidemic of poverty in this country. Nobody wants to talk about poverty—as though discussing it were a virus—and yet it is a growing problem and I suspect that things will get a lot worse before I see a roof over my head anytime soon. I send this to you as an eye opener to what folks like myself go through everyday. I know you’re a busy man who gets maybe thousands of letters but if my story helps you to see what homelessness is really like, then it was worth the effort to send my story to you. Thank you for all you do, Mr. Moyers! Last week I previewed broadcaster Tavis Smiley’s nationally televised conversation about poverty in America and call for a White House conference on poverty. It took place in Washington, DC, last night, and I will have a post about it next week. You can watch the program in its entirety here, and sign on to Smiley’s call for a conference on the eradication of poverty here. Audio Conference: Health Reform—Implications for Part-Time Work: Thursday, January 24, 3-4:15 pm EST. With a year to go before the Affordable Care Act takes effect, advocates, low-wage workers and others are concerned about several employers' claims that they will cut workers hours because of the law’s focus on coverage for full-time employees. The Center for Law and Social Policy (CLASP), Families USA and the University of California Berkeley Center for Labor Research and Education will cosponsor an audio conference to explore questions including: Are employers incentivized toward a more part-time workforce? Register here. Set Up Face-to-Face Meetings with Members of Congress: One of the most effective strategies to sway your Representative’s opinion on protecting vital programs in the upcoming budget talks is an in-person visit. RESULTS lays out how to do it. “Are Food Insecurity’s Health Impacts Under Estimated in the U.S. Population?” Dr. John Cook et al., Children’s HealthWatch. This study demonstrates that the US is underestimating the number of people struggling to put food on the table. Currently, there are a substantial number of people—particularly children—classified as “food secure” when, in fact, they live in households with “marginal food security” and experience adverse health outcomes that are similar to children who are “food insecure.” These findings have significant implications for proposed budget cuts to food and nutrition programs that prevent these adverse health effects. The report also underscores the need for outreach workers and clinicians to be aware of people in this middle ground who lack enough food for an active, healthy life. “How marginal tax rates affect families at various levels of poverty,” Elaine Maag, C. Eugene Steuerle, Ritadhi Chakravarti, and Caleb Quakenbush, National Tax Journal. High marginal tax rates can put severe limits on upward mobility for low-income families. This study shows how these rates can differ vastly from state to state depending on variations in tax rates as well as state-specific benefits from programs like SNAP and TANF. For example, in 2008, a single parent with two children moving from no work to poverty-level earnings can have a rate ranging from -13.3 to 25.5 percent. For families moving from no work to having a worker earning 50 percent of poverty-level earnings, the rates vary from -27.9 to 36.3 percent. The starkest overall impact is for single parents with two children who move from 150 percent of the poverty line to 200 percent—in which case, rates range from 41.5 to 57 precent. “Coping with the Great Recession: Disparate impacts on economic well-being in poor neighborhoods,” Robert Lerman and Sisi Zhang, Urban Institute. This study parses the effects of the recession on people living in different types of neighborhoods. Though the recession didn’t forgive anyone—over 60 percent of US families lost wealth between 2007 and 2009—it hit residents in poor neighborhoods especially hard. Some people were already at rock bottom, and therefore didn’t lose much; for example, poorer families lost less income, and unemployed single mothers didn’t see a significant drop in employment. In other cases, poor neighborhoods saw distinct effects; homeowners in high-poverty neighborhoods, for example, suffered higher levels of mortgage distress than homeowners in low-poverty neighborhoods. What’s more, renters, who are more likely to populate low-poverty neighborhoods, experienced a bigger decline in employment than did homeowners. “Low-Income Working Families: The Growing Economic Gap,” Brandon Roberts, Deborah Povich and Mark Mather, Working Poor Families Project. This report throws in stark relief the ongoing crisis faced by those at the bottom of ecomomic the ladder. The total number of people in low-income working families—that is, those who live below 200 percent of the official poverty threshold (less than $36,000 for a family of three)—now stands at 47.5 million families. All but two states saw an increase in the number of low-income working families between 2007 and 2011, with the greatest increases happening in the South and West. During the same period, the proportion of children living in such families has increased from 33 to 37 percent. With fewer resources at home, these children face an uphill battle in completing school and finding jobs. A particularly large burden is housing: 61 percent of low-income working families spend more than 33 percent of household income on mortgage or rent payment, utility costs and related expenses. Twice the poverty level (less than $46,042 for a family of four): 106 million people, approximately 1 in 3 Americans. People in families experiencing homelessness on any given night, US: 238,110. Percentage of homeless population who are veterans: 12 percent, or 67,000 people. Children living on streets or in homeless shelters: more than 1.6 million, and 42 percent are under age 6. —Michael Reisch, Distinguished Professor of Social Justice at the University of Maryland School of Social Work, on proposals to raise the age to qualify for Social Security. James Cersonsky co-wrote the “Clips” and “Studies” sections of this blog.